A simple cache in a beautiful spot that's fairly hard to get to. The Legend: Many years ago, the Shaman of the tribe of native Lenni Lenape had a vision. He spoke of this vision with the tribe's Chief telling him that they must build a mound and from this mound they will see the fate of their tribe. The Chief gathered his people and told them of the Shaman's vision then took up a handful of earth and carried it to the Shark River valley where the tribe would have their ceremonies. The tribe members followed and, one bowl full of dirt at a time, they began to create the ceremonial mound. It took many years but the mound eventually became a hill. It is said that from the top the Chief could hear all of his people and see all of their lands. One day during their morning ceremony, a young squaw looked out to the East and saw tall ships docked along the coast. The tribe asked the Shaman what it might mean but the old man wasn't looking - he was listening. Then they could all hear it - approaching hoof beats. Men were coming on horseback, drawn by smoke from the tribe's fire The Chief turned to the Shaman to ask what they should do but he was not there. Where he stood they saw a few butterflies fluttering in the wind, being blown to the West. It was then that the tribe knew their fate. To this day you can stand up on the hill and listen to the "hoof beats" of modern man though the hill has been much eroded by time and horsepower. While the Lenni Lanape are long gone, you will find that the butterflies remain. The Cache: You are hunting for a small round lock-n-lock camouflaged to blend in. You will want to approach the cache from Campus Parkway near the Gateway cache and follow the road until it becomes a trail. At that point, you're on your own. Only minimal bushwhacking required. Downhill leads to the source springs of the Shark River. Uphill leads to a smiley! 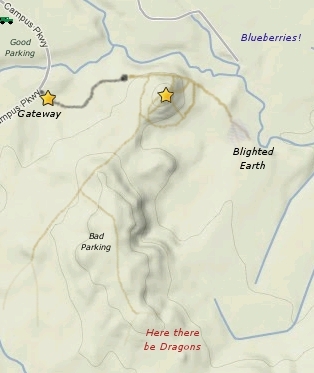 Check the trail map for details. Hunting is no longer allowed here but just in case you might want to wear your orange in the Fall. This is a special place that gets little respect from the few who visit. Practice CITO when necessary and enjoy the hike!